Most of the drilling has been conducted on the Romilda 1 Concession, which comprises 1,000 ha. The Romilda 1 Concession is bordered on the north and south by other Ferrobamba properties. 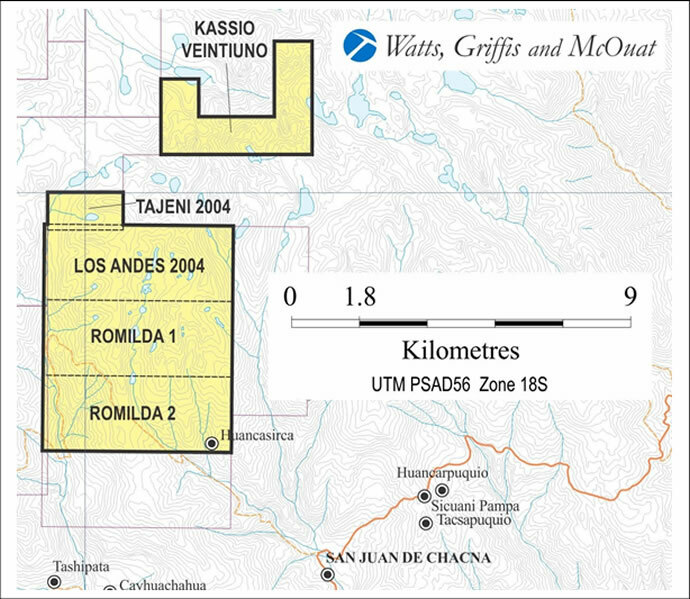 The Los Andes 2004 and the Romilda 2 concessions contain massive outcropping iron ore mineralization that requires extensive drilling. The mineralization observed in the Project is skarn-type mineralization. Mineralization in the project is of the same general type as that which occurs in several other locations in Peru, such as Cuervo Resources’s Cerro Ccopane project located 150Km to the east. In late 2007, Ferrobamba geologists delineated several outcrops of iron mineralization consisting predominantly of massive magnetite-rich material. These outcrops are exposed intermittently along the west margin of the Romilda 1 Concession. In 2011, several sampling programs verified the mineralization and identified additional Skarns. In addition reconnaissance magnetic & gravity surveys were completed. A new topographic survey of the central part of the Project and the environmental permitting process for the 2013 drilling program has also been completed. In 2013, the exploration program included an initial drilling program of 24 HQ diamond drillholes, for a total of 5,209 m. Drilling was completed only on Skarns 4 and 7; leaving six Skarns still to be drilled. Ferrobamba plans to continue drilling the remaining six Skarns as part of the planned pre-feasibility study, starting with the highest geophysical priority. A series of metallurgical tests were carried out on selected samples from the 2013 drilling program. Preliminary metallurgical testing has indicated that using low intensity magnetic separation the mineralization could produce a high grade concentrate of about 68% Fe with high weight recovery. The mineralization is anticipated to produce a marketable product with low deleterious elements, less than 3% SiO2, and utilizing flotation, will achieve less than 0.05% S. The material is relatively soft and should require low energy for grinding. Based on information from the 2013 drilling program, WGM completed an initial Mineral Resource estimate on Skarn 4 and Skarn 7. The classification of Mineral Resources conforms to National Instrument 43-101 and Council of the Canadian Institute of Mining Metallurgy and Petroleum Standards. The table below details the final result of the initial NI43-101 compliant Mineral Resource estimate of Skarn 4 & Skarn 7. The Aymaraes Project Inferred Mineral Resource of 384.7 million tonnes of iron ore estimated by WGM has excellent potential to be significantly expanded. 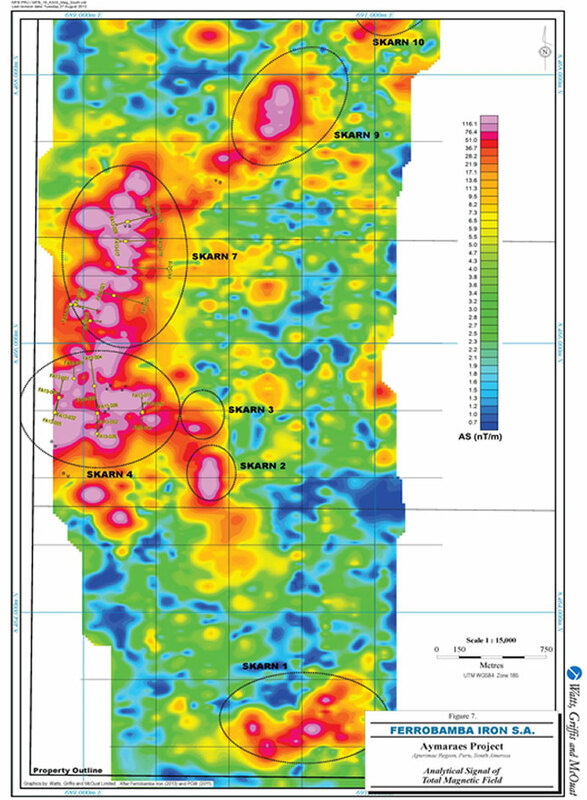 PGW updated its 2012 geophysics study with the drilling results and core susceptibility measurements resulting in a total “resource potential” of 1.4 billion tonnes. Additional work is planned as part of the pre-feasibility study to delineate this potential.